I simply use this ; “Knowledge management is about what to DO when you don’t Know”. Over the past few weeks, I have been contemplating this comment. I think it has much to commend it, but it also raises a slight terminological problem. What do we do when our knowledge runs out? I don’t think we do ‘knowledge management’ as individuals. We certainly aim to develop, deepen, extend, broaden or redirect our knowledge — this is learning. Also, we don’t necessarily go to the same places for that learning every time. Organisations might aim to do things to facilitate that learning process, and we might call this ‘knowledge management’, but I am less and less certain that this is a sensible phrase. Separately, I was reading Knoco’s recent newsletter (pdf), and found an article which builds on Yasmin Fodil’s experiences observing knowledge and learning at NASA’s Goddard Space Flight Center, which she reported on her blog (and cross-posted). In the blog post there are some useful diagrams summarising the people-centric approach used at Goddard; the whole piece is well-worth reading (and following the links to the Goddard material itself). Knoco took one of those diagrams and embellished it. I have embedded that one below (click to see the original). This table made me reflect on my own knowledge and learning behaviours, as well as those I see around me. In the column headed “How can I learn it?” there are certainly some tools and techniques that benefit from external (call it ‘KM’) input, but the starting point (learning from one’s own experiences) depends on individual commitment. I think this makes two things clearer. Firstly, what I myself know contributes to the knowledge of my network, which in turn is part of the wider firm’s knowledge (although people’s personal networks usually include participants from outside their own organisation, or their immediate working group, I am ignoring that for simplicity here). When individuals have good personal knowledge practices (even if it is just making good notes that can be easily accessed and used in one-to-one conversations), their wider contribution is almost inevitably higher quality — to the benefit of those around them. As a result of this cogitation, I have amended the description of KM in the comment I quoted above. For everyone, knowledge development is about what to do when you don’t know. When you don’t know, you need to ask: from whom can I learn? When you see people around you who appear not to know, you need to ask: how can we learn together? or what can they learn from me? For the firm, facilitating knowledge development is about creating the best environment to encourage effective learning and knowledge sharing. This virtuous circle of knowledge exchange and learning helps to create a more agile organisation primed to respond creatively and innovatively to client demand, legal change, and market shifts. That last justification of our knowledge activities is one that often crops up. Better use of knowledge promotes innovation goes without saying, doesn’t it? But if that was the only reason organisations did ‘KM’ then why do all that traditional stuff around ‘best practices’, standard documents, house style and taxonomies and so on? The commonly-stated problem with all that boring stuff (and I have been as guilty as anyone else of such comments) is that it just crystallises past practices, that if we do what we have always done, we will just get the results we always got. But sometimes that consistency and predictability is really what we (and our clients) actually want. We (and of course, I really mean ‘I’) need to be careful not to jettison the baby with the dirty bathwater. Organisational knowledge activities (building on good individual behaviours) do contribute to innovation and creativity, but they also ensure consistency, improved quality and risk-avoidance in the boring old stuff as well. The challenge is to steer a sensible course between the two — to do the things that will achieve both aims, even when they appear to conflict. Previous Post KMers can do anything: is that wise? Totally inspiring stuff. It’s turning the tables on the way we have always approached KM (the boring stuff you quoted) and enabling us to steer a path that is far more sustainable. Thanks! Thank you for the encouraging comment. I wasn’t sure if I was just stating the blindingly obvious, but the bee in my bonnet had to be let out! Thanks for the post and the reference – that’s certainly how I see KNowledge Management, and your concentric circles certainly show knowledge in context. 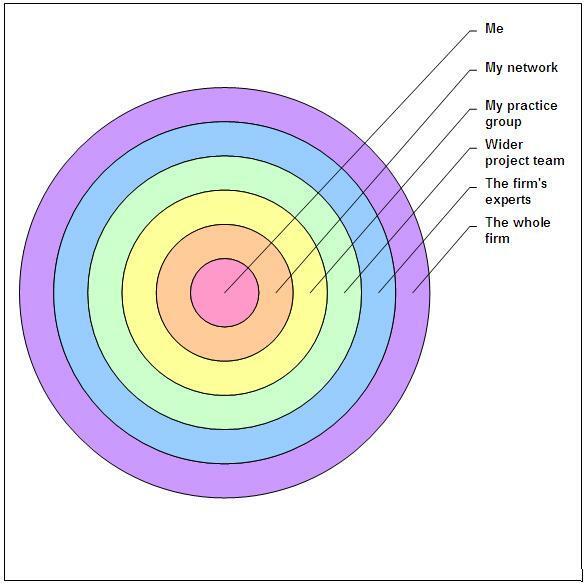 However what you miss in concentric circles is the community of practice, which intersects many project teams, but does not contain them. But its hard to get everything in one diagram. Thanks Nick. Interestingly, I am not aware of significant CoP use in law firms. I am not sure why that is — possibly it is due to the fact that they aren’t in fact particularly large organisations, so informal networks suffice. I want to follow up on the terminology point in another post. I think your interpretation is right, but not always understood within the wider organisation. I like how Nick’s way of framing it brings out the importance of the management aspect of KM. On the other hand, I could see it being used to argue against the need for dedicated KM professionals, because “understanding the importance of knowledge” sounds like something all managers should do – and so they should, but I think all but the smallest organisations benefit from having a manager who has knowledge as their main focus, if only to help stimulate the others to keep it as a regular part of their work. Good post, Mark! What to do when you don’t know. This resonates with me in particular as the approach I take when I put together a strategy to capture information, especially from human sources, for competitive intelligence work. I don’t know and the client doesn’t know so I put together a plan about how we’ll “find out.” Your approach to KM is more about general learning. For CI I take each of your circles and dig deeper to find the people I should connect with, and in what order, so it’s a more tactical/operational approach. I also like your chart of sources and dig into community of practice heavily outside of the firm to keep from being blindsided by the company’s culture in learning.